I don't have a good memory, especially for details. That's one reason I started this blog. However, there are some days and/or events for which I can remember every single detail. For example, I, like most moms, can recall the tiniest specifics of the births of each of my girls. 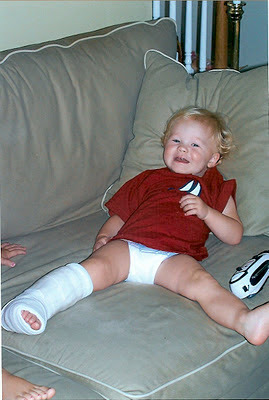 I can also recall with great clarity the afternoon of August 1, 2006; the day Megan broke her leg. Isn't she cute with her pint-sized cast? Although I could rehash every single detail, I will try to summarize. We had some friends over for a palydate and, just after lunch, Megan, who was then 20 months old, was standing on our ottoman. Her big sister, Rachel - then just a few days away from turning 4 - decided to "help" Megan get down. Somehow, Megan came down on her knees with her right leg twisted up underneath her. There was no loud pop or anything, just crying - lots of crying. Since I had never had a broken bone, I wasn't sure what to look for, but my friend (the other playdate mom) and I carefully examined Megan's leg and foot. We saw no deformity, swelling, or bruising. However, her crying continued despite my multiple attempts to comfort her. (At some point, I called DW because he has had several broken bones. When I explained the symptoms over the phone, he said it was probably just a sprain.) After about 45 minutes of crying and attempted consoling, I called the pediatrician who referred us to an orthopedic. When the orthopedic's office said "can you be here in 30 minutes?" I threw some snacks in the diaper bag and quickly loaded both kids into the van. Things got worse from there. At the doctor's office I had to manipulate Megan's leg (with help from a nurse) and hold it in about three different positions so they could get x-rays. Rachel waited in another room with an unfamiliar nurse to avoid exposure to the x-ray radiation. Finally, the doctor came in with the diagnosis - "It's broken." Now I realize there are many things worse than a broken leg. At that moment, though, it felt like I had been sucker punched right in the gut. My sweet little 20 month old girl with a broken leg?? Oh my!! The doctor assured me that she would be fine. "Young bones" are soft which means they heal quickly. Then, we were off to yet another room where nurses would apply Megan's temporary cast. This was possibly the worst part of the day. We were exhausted - physically and emotionally. Yet, in this final room, I had to sit on an exam table with Megan on my lap and Rachel by my side while one nurse held Megan's leg at 90 degree angle and the other nurse wrapped it. Truthfully, it probably only took about ten minutes, but it felt like so much longer. Megan sat on my lap so bravely and, through more tears, repeated one of the few phrases in her 20 month old vocabulary; "All done Mommy. I all done!" Indeed, everyone was "all done" on so many levels. By the time the cast was finished everyone in the room was in tears. Back in the minivan, I took a few minutes to collect myself and call my hubby (the guy who said it was surely just a sprain). Then we headed home where we almost literally collapsed and melted into the couch. Just as the doctor promised, though, her leg healed quickly and completely. It was, however, a sign of the future. You see, Megan has always been rather accident prone and the broken leg was just the beginning. Fortunately, we haven't returned to an orthopedic or ER for another cast or stitches, but Megan has fallen down stairs, walked into walls, and tripped over her own two feet more times than I can count. It has gotten a little better over the past couple years, but still, I constantly find bruises and scrapes on her - sometimes in very odd places. Half the time, she can't even remember where, when, or how she got them! Despite her bumps and bruises, she is always smiling! 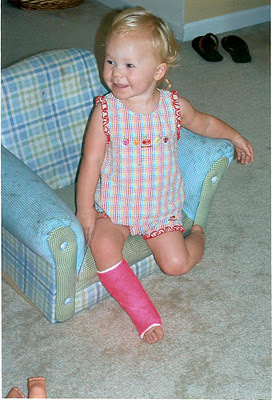 Even when she had a hot pink cast on her little bitty broken leg 5+ years ago! By the way, tuck this tip somewhere in your mommy memory. If your child ever needs a cast, ask for one that is waterproof! I got that advice from a good friend before Megan got her "permanent" pink one and it was truly a lifesaver. She was able to bathe and swim with it, no problems. It may cost a little extra, but will be worth every single cent!